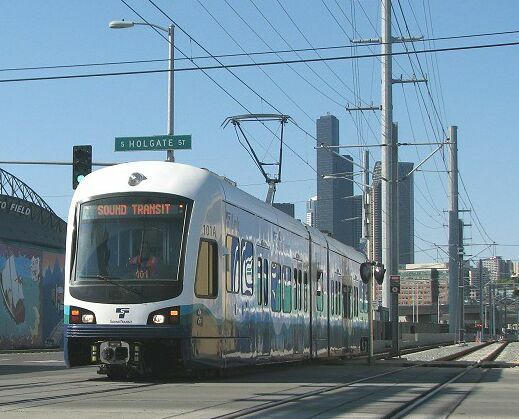 On July 18th Sound Transit – the Seattle-Tacoma regional transit agency – began revenue service for the initial segment of the Central Link Light Rail line in Seattle, Washington. After an initial ribbon-cutting ceremony at the Mount Baker station in South Seattle, train service opened to the public at 10:00 (10:00 a.m.). 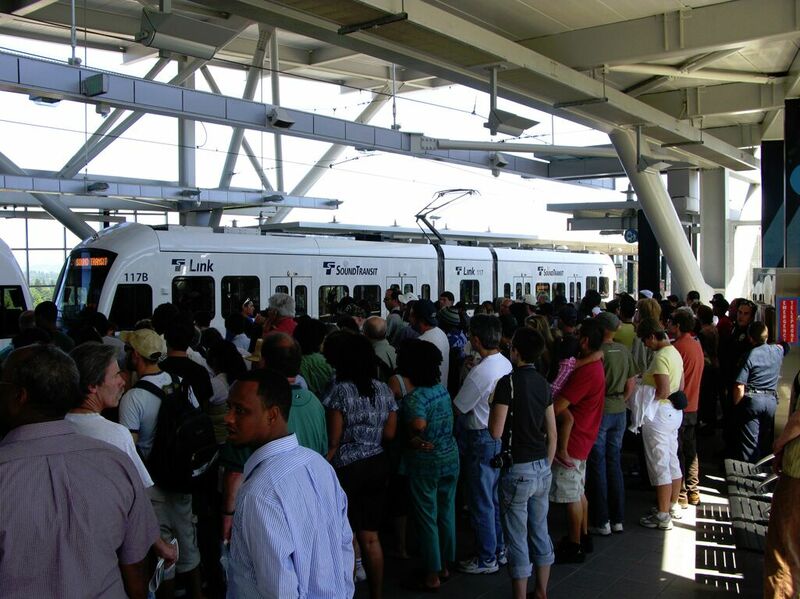 Riders were willing to wait up to half an hour to board the light rail trains for free rides, and officials estimated that more than 92,000 passengers boarded the trains during the first two free-fare days. More than 92,000 passengers tried out the new Link LRT system over the first two free-fare days of the line's inauguration. "We now join the cities of the world. We are growing up..." Seattle's then-Mayor Greg Nickels told the Seattle Times on the inaugural train Saturday morning, 18 July 2009. The initial segment of the Central Link Light Rail is a 13.9-mile (22-km) line from the Westlake Station in the Downtown Seattle Transit Tunnel (DSTT) through the SoDo industrial area, Beacon Hill, and the Rainier Valley, and ending at the Tukwila/International Boulevard Station, next to the SR-518 highway. The trains run every day between 05:00 and 01:00 (1:00 a.m.), every 7.5 minutes during peak hours, and every 10 to 15 minutes at non-rush hours and on the weekends, with rides between downtown and Tukwila taking 30 minutes. A 1.7-mile (2.7-km) extension south to the Seattle-Tacoma International Airport (SeaTac) will open in December 2009, and buses connect the Tukwila Station to the airport in the meantime. There are twelve stations, increasing to thirteen when the line to the Airport opens. Of the 14-mile initial route, 2.5 miles consist of existing and new tunnels, 5 miles are elevated, and 6.5 miles are at-grade, with some level crossings. 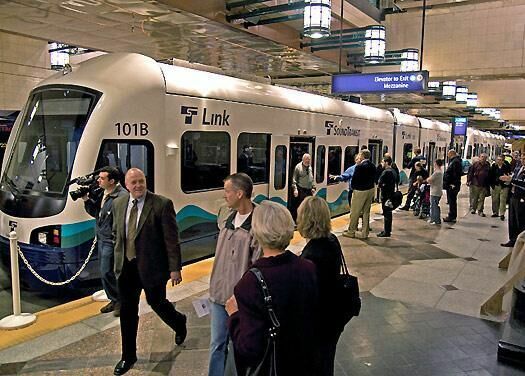 The inauguration of Link represents the culmination of more than 40 years of effort to bring rapid transit to Seattle – a process summarized in our companion article Seattle's Arduous Political Trek to Its New Link Light Rail Transit System. 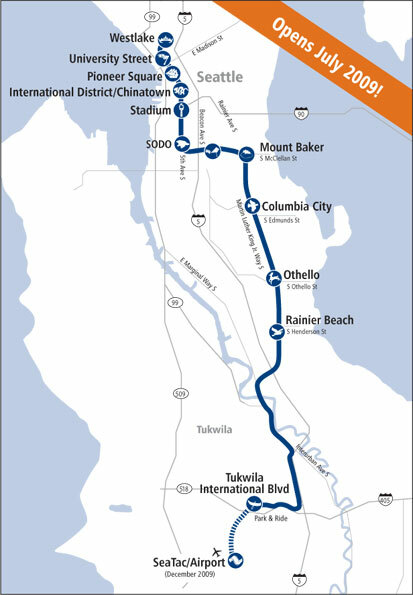 Sound Transit plans for the light rail system to extend for 55 miles (88.5 km) by 2023. The first extension will be 3.5 miles (5.6 km) north to the University of Washington. The Federal Transit Administration (FTA) awarded $813 million for the University Link extension, amounting to 50% of the estimated costs. Construction has begun on a three-mile tunnel under Capitol Hill, and service to the University of Washington is scheduled to begin in 2016. In November 2008, voters in Central Puget Sound approved Sound Transit 2, a 36-mile (57.9-km) extension of the light rail line north to Lynnwood, east to Overlake, and south to Federal Way by the early 2020s. Link's rolling stock consists of 35 new LRT cars that Sound Transit purchased from Kinkisharyo/Mitsui of Osaka, Japan. The first car was delivered in November 2006, and testing began in early 2007. The cars are 95 feet long, double-articulated and 70% low-floor. The trains will initially run with two cars, but they may be expanded up to four cars. Each car has 74 seats and a total capacity of 200 passengers, though only about 120 would travel comfortably. South of the downtown area, speeds will reach up to 55 mph. The trains are equipped with MicroCab automatic train protection (ATP) systems, which provide vehicle operators with current speed, permitted speed, and overspeed displays, and automatically enforce vehicle braking when required. [Information from Sound Transit website]. Funds for the project came from several sources: the Federal Transit Administration (FTA) provided a $500 million grant for the initial segment and $57 million for the line to SeaTac Airport; $2.07 billion came from local sales tax; and the remainder from a 0.3 percent (or $30 for each $10,000 value) motor vehicle excise tax, or "car-tab" tax, which is levied in the Sound Transit District. These taxes are collected in Seattle and the North King County cities of Shoreline and Lake Forest Park and the South King County suburbs. Taxes in neighboring counties are reserved for projects in those areas. Originally, Sound Transit purchased 31 railcars for the initial segment, at a cost of $125 million, or abut $4.03 million per vehicle. Another $7 million was added for contingency, bringing the total to $132 million. An additional 4 vehicles were purchased for the Airport Link and 27 vehicles for the University Link lines [Linda Robson, Sound Transit Media Relations, e-mail correspondence, 30 July 2009]. Subtracting the $132 million cost of the vehicles, the per-mile cost is about $151 million, which included construction of a deep tunnel, reconstruction of tracks in another tunnel, and construction of substantial elevated sections. Therefore, the costs are considerably higher than what would be more typically expected for most light rail systems in the USA. Sound Transit has contracted with King County Metro for operations and maintenance of the Central Link system. The workforce consists of about 145 full-time employees, including 56 operators. Operation and maintenance costs are estimated at about $45.5 million for each full year of operation between 2010 and 2014 (this estimate includes contingency but not depreciation). The cost per service mile is estimated at $8.51 and the cost per boarding is estimated at $9.09. An operations and maintenance facility was built in south Seattle adjacent to the mainline. [Information from Sound Transit, Adopted 2009 Budget, Dec. 2008]. Sound Transit officials project 21,000 average weekday boardings by the end of 2009, and 26,600 in 2010, after a year of operation. They plan to have 280,000 daily boardings by 2030. [Seattlepi.com, 20 April 2009]. Seattle already has relatively high transit use, mostly on buses – 17% of people who work in the city took transit to work, according to a US Census Bureau survey in 2005. Sound Transit predicts that in the long term, about two-thirds of Link riders in the South End will be new transit users who would not otherwise take a bus, and the light rail line is projected to reduce freeway congestion in the South End by about one percent. [Seattle Times, 17 May 2009]. The base adult fare is $1.75, with a 0.5-cent increase for every mile and a maximum fare of $2.50. Under Link's proof-of-payment system, riders do not go through a turnstile, but may be asked to show their tickets on the train. Last April, transit agencies in the region, including Sound Transit, implemented new regional transit cards, called ORCA (One Regional Card for All) that can be used on buses, trains, and ferries. It is a plastic card containing a microprocessor that passengers tap against electronic readers. Riders can buy monthly passes and up to $300 of credit, and can use them for transfers and multiple modes in one trip. Paper transfers will eventually be eliminated for trips between multiple agencies, so that only card users will get free transfers. After an initial period of about six months, the cards will cost $5, as an incentive for customers not to lose them. 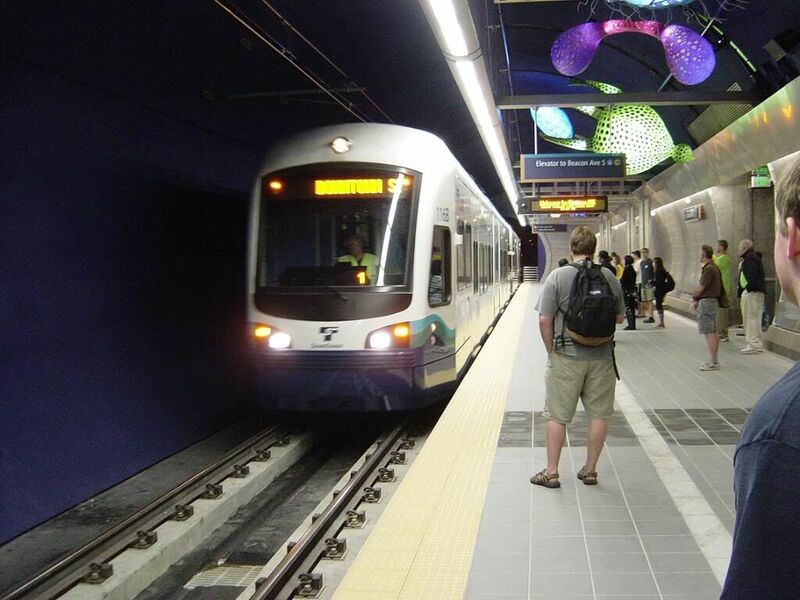 To expedite train movements through Seattle's CBD, Sound Transit retrofitted an existing major asset – the 1.3-mile Downtown Seattle Transit Tunnel (DSTT) and its existing stations – for joint use by both light rail trains and buses. During a peak hour, about 55 buses use the tunnel, and the LRT trains run every 7.5 minutes. Opening-day Link train in DSTT, now shared with "bus rapid transit" service. The DSTT serves the central business district and downtown shopping centers with existing stations at Westlake, University Street, Pioneer Square and the International District/Chinatown. It is the only joint bus and rail tunnel in the USA, except for one in Pittsburgh, which does not have stations. Originally built in 1990 as a busway facility, the tunnel included train tracks; but they were not adequately insulated. For the Link project, these had to be extracted and replaced, fitted with a "rubber boot" to contain stray electrical current that could cause corrosion over time, as part of an $87 million retrofit between 2005 and 2007. [Seattle Times, 21 May 2009]. The tunnel also underwent electrical, mechanical, and safety systems upgrades. Passengers wait to board incoming Link train at Beacon Hill station during line's opening. Sound Transit trains enter the tunnel by traveling uphill on trestles, since the entrance is higher than the valleys on either side. The station, roughly 16 stories down, is described as "one of the seven wonders of the light-rail world" by Peter Cipolla, vice president of Hatch Mott MacDonald, consulting engineers on the tunnel. [Seattle Times, 15 June 2009]. The line to the University of Washington will include another tunnel, about 4 miles long. Extending under First Hill, the Montlake neighborhood north of the CBD, the Ship Channel and the university campus, this will be one of the longest LRT subways in North America. As Sound Transit began testing its LRT railcars in the spring, there were three accidents during that time, two involving motorists and one a pedestrian. All three incidents occurred in Rainier Valley, where the trains run in a median at street level, and there are 28 street crossings. Sound Transit did not install crossing arms at the intersections because trains are traveling at 35 mph or less, and neighbors did not want them. [Seattle Times, 30 June 2009] The number of auto accidents along the line in Rainier Valley is expected to decline, because the train tracks replace two-way left-turn lanes that have themselves been implicated in a number of accidents. In addition, by diverting travel from motor vehicles to LRT, the new transit service is expected to reduce traffic somewhat. To achieve a safe environment, particularly for pedestrians, Sound Transit has implemented a number of safety measures.  Warning signs with a train icon flash when trains approach. To further enhance overall security, Sound Transit has added more than 60 new security guards, and Sheriff's deputies patrol the line. King County Metro controls operations in the DSTT at the Operations Control Center south of the tunnel. If trains are not able to enter the downtown tunnel due to some type of emergency, there is a switch south of the station that will permit the trains to run from Tukwila to the station near Safeco and Quest Fields. The new Link LRT line will improve access throughout the city, and station platforms are about 400 feet long to accommodate four-car trains to handle passenger growth in the future. Sound Transit commissioned about forty artists to create new works of art for the stations. Several new stations have particularly distinctive features. The International District/Chinatown Station is an important transfer hub for Sound Transit's Sounder regional passenger rail, and buses, and improves transfers to South Seattle and downtown. The Mount Baker Station is located in a commercial hub, adjacent to a large, recently opened bus transfer station. The Stadium Station is expected to attract between 170,000 and 250,000 round trips a year, mostly for sports events and concerts. The Tukwila Station is fairly elaborate, with three levels and wide, open concourses.  Next to the Othello Station, a 420,000 square-foot mixed-use project with 352 living units is planned.  Sixty-seven low-rise town homes are planned for about a block north of the Rainier Beach Station.  Three big housing complexes are planned for the Ranier Valley, largely for low-income and market-rate buyers. A development of 435 homes has been finished west of Martin Luther King, and work starts this summer on a 444-home complex. The city of Seattle and Sound Transit want to encourage people to walk, bike, and take buses to the Link stations instead of driving a car there. As a result, project designers did not build any park-and-ride (P&R) lots for the Seattle stations, and the only P&R lot on the line is adjacent to the Tukwila Station, providing 600 spaces with free parking. The goal of this decision was to support station areas becoming vibrant places oriented towards pedestrians, bicyclists, and transit users – not commuter vehicles driving to the stations. Regulations were put in place, through early station-area overlay zoning, that prohibit both the construction of stand alone parking lots and garages, and the designation of off-street parking spaces for long-terms use. Seattle's Comprehensive Plan, Transportation Element (Jan. 2005) states that official policy is to "Discourage the development of major, stand-alone park-and-ride facilities within Seattle." There are some exceptions, such as at the terminus of a major transit system, where transit parking can be shared with another development, and where there are inadequate bus connections or pedestrian and bicycle access. The provision of parking near light rail stations is controversial. If not enough parking is provided, it can limit access to the light rail and may reduce the number of riders. Some people are unable to bike or walk or live too far to do so. Connector buses will provide access for many people but not all; and since in most cases, 40% or more of light rail riders formerly drove to work, these people will likely want parking facilities, not feeder buses. On the other hand, if there is too much parking, the benefits of light rail from reduced congestion and environmental impacts will be lower because of the vehicular traffic generated to access the LRT stations. In addition, parking lots take up valuable space that could be used for transit-oriented development near the stations. Bus routes are being revised to connect with the light rail stations, but changes to the bus routes were not implemented on the opening day of revenue service. As a result, some people may have not been able to take buses to the stations initially, which may be affecting ridership levels. In the judgment of Sound Transit planners, when bus routes are changed to correspond with the start of rail operations, there can be confusion for riders and difficulty making connections. Transfers between buses are free but transfers from the Link to buses are not. Access to Link via bicycle is encouraged by the availability of bike lockers at each station and special hooks onboard the trains, with up to four bikes allowed per car. The Sodo Station has the largest bike facility on the route, with 64 covered bicycle parking spaces and 24 bike lockers, and a bike trail to Stadium Station. 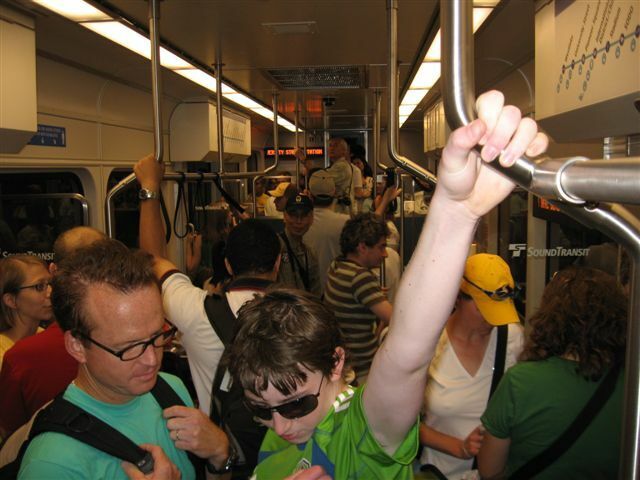 According to Light Rail Now Project senior technical consultant Ed Tennyson (e-mail, 24 July 2009), steel wheels on steel rail are usually quiet, and the brakes are either silent (dynamic) or low sound at low speeds (friction.) The noise near the Tukwila station may be caused by the new railheads not yet fitting the new car wheels, so the area of contact is too small to distribute the weight and pressure builds up, resulting in a squealing noise. Otherwise, the noise may be caused by either a break in the railhead for a switch or a broken rail. In February 2008, Sound Transit became the sixth transit agency in the USA to receive certification from the International Organization for Standardization (ISO) for agreeing to implement international standards (the ISO 14001) for environmental sustainability. The Sound Transit Board adopted a Sustainability Initiative in 2007 that includes measurable targets related to fuels, vehicles, and emissions; ecosystem protection; green procurement; recycling and waste prevention; energy and water conservation; sustainable design and building; and education and awareness. Crowd of eager passengers packs Link train at Westgate station on opening day of service. Original research and narrative for this article were provided by LRN Research Associate Susan Pantell; additional information and analysis were provided by others on the Light Rail Now Project team.